Like an hourglass figure or the ability to save any of my Chipotle bowl for later, long, fluttery lashes are something I gave up on having a long time ago. But acceptance does not mean admitting defeat, and over the years, I've tried everything under the sun to fake a doe-eyed look. Lash serums? Done that—I found that they helped with length but not with volume. Eyelash extensions? Had them for a year and a half and then was so traumatized by the broken, stubby state of my bare lashes when I got them off that I've rarely gotten them since, even though I love the way they look. Every mascara under the sun, all promising me the world? Like boys with tousled hair and an inability to commit, most of them fell far short of their promises. (Benefit Badgal Bang and Marc Jacobs Velvet Noir were two of the few that didn't disappoint). When it comes to long lashes, some might call me an obsessive—though, I prefer the term "devoted fan." So when I met with the founder of a company called Lashify who promised me her at-home lash-extension product was groundbreaking, my thin, barely-there lashes and I were more than intrigued. Spoiler alert: I'm never getting lash extensions again. The item above is Lashify's hero product called the Control Kit. It's sleek and about the size of a Chanel Wallet on a Chain bag, though much less expensive. But like a Chanel bag, having it in my possession has given me a great amount of joy. The backstory: Lashify's founder, Sahara Lotti, was a lash-extension devotee like myself but was tired of going back for refills every few weeks and spending upward of $100 each time, not to mention seeing the damage it was doing to her natural lashes (same). Determined to find an alternative, she went straight to the motherland of beauty innovation: South Korea. There, she found a manufacturer that was able to create the lightest, wispiest lashes on the market (seriously, they don't weigh anything), which she dubbed Gossamers (see below). Next, she just had to figure out a way for the average woman to learn how to apply them, which is how she developed Lashify's unique fusing wand and bonding adhesive. The Gossamer lashes come in little clusters and, at first glance, look similar to the individual lash clusters you can buy at the drugstore (or spiders, according to my brother's alarmed reaction when I bought them with me on a recent trip home). But the thing that sets these apart is how light-as-air and realistic-looking they are. Anyone who's worn false lashes knows that the classic ones all have that telltale strip at the base of your lash (dead giveaway), and even the individual-cluster lashes are thicker and more plastic-looking than anyone's natural lashes. Not the case with Lashify Gossamers. First of all, you apply these from below your lash line at the base of your lashes, so you literally can't see where your natural lashes start and the Gossamers begin. Second of all, unlike normal falsies, they can actually last three to five days, thanks to Lashify's "fusing" technique. And lastly, they come in three different curls and lengths that all look freakishly natural and real. "A" is the most natural, "C" is for curl, and "B" is for bold. Each of these types also come in three different lengths: 10, 12, and 14. So an A10 lash would be the most natural-looking, a C12 lash would be curled and slightly longer, B14 would be your boldest-looking lash… You get the idea. As you can see in the makeup-free photo above, my natural lashes are practically invisible without the help of mascara. Seriously, though—where are they? Ah, there they are. But they're not my real lashes—they're Lashify. See how realistic they look, though? It's almost like I'm one of those people who can just tint her lashes and call it a day (what must that be like…). So here's how it works. In the Control Kit, there's a dual-sized bonding adhesive. One side is white (which is stronger) and the other black (which you can use to touch up your lashes throughout the three-to-five-day period you have them on). I wiggle the adhesive brush (which looks like a super-skinny plastic mascara wand) at the base of my lashes to disperse the adhesive, then use the tweezer-like fusing wand to pick up a Gossamer and place it at the base of my lashes from below. Once you're happy with the look, you "fuse" the lashes to your actual lashes using the Fusing Wand (it's sort of like curling your lashes, except you're holding the wand sideways when you clamp down).You have about a minute or two to work with it before the adhesive dries, so there is that slight time pressure. As someone who gets her best work done under a time crunch, I find it slightly exhilarating. Each Control Kit comes with two sets of Gossamers, but you can also order more separately. 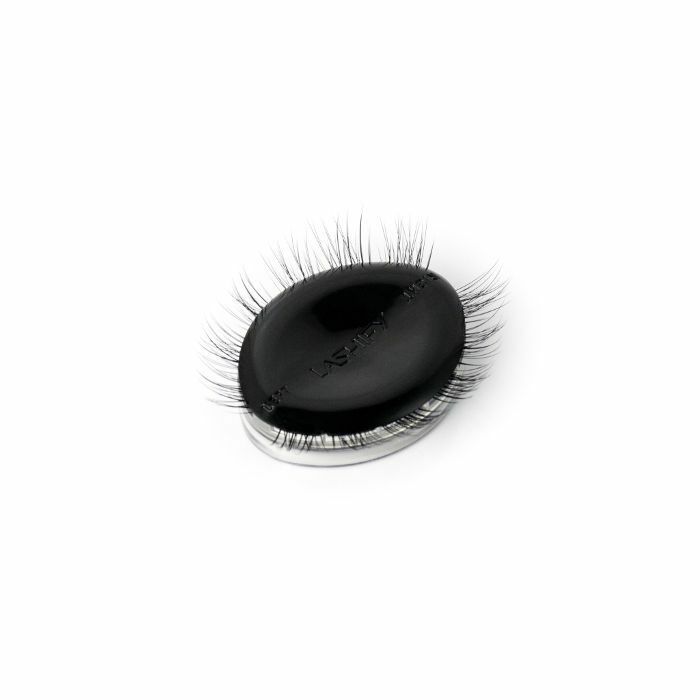 The part I love most about this product is that you are in charge of customizing the lash look you end up with. I like a very natural, slightly feline look, so I usually place two A12 or A14 Gossamers on the outer edge of my eye, then a C12, then a C10 in the very inner corners. The end result is a super-natural, fanned-out effect. It takes a little while to get the hang of the technique, but I felt pretty confident in my ability to use Lashify after the second or third time practicing (though I do have a pretty steady hand, and not to brag or anything, used to apply my eyeliner perfectly in the car while driving to work when I lived in LA. Yes, I'm also very modest—why do you ask?). Nowadays, it takes me less than 30 minutes to do a full set of lashes, and less if I'm just filling in. Plus, Lotti does daily Instagram Live tutorials on Lashify's Instagram page so you can get a visual of how exactly to use the kit and get her tips. I like to finish off the look by filling in my waterline with a black gel eyeliner and then flicking out a tiny baby wing in each corner with liquid liner—I found that this really makes it so that the Gossamers look super natural. The lashes definitely look the best on the first day, and then I've found that it's hit-or-miss on how long they last. The other day, the Gossamers felt like they were coming loose after just one day (nothing a quick fusing couldn't fix), but I've also gone to a bachelorette in New Orleans with them on, lost my kit under mysterious circumstances on the first day, and still been happy with how they looked on day four (and let's just say they'd been through, ahem, a lot by that point). The secret is to use the Fuse Control Wand once before bed each night to keep your lashes secured, and then touch up whenever it seems like any of the Gossamers might be coming loose. And because you're probably wondering: yes, you can shower with them in—I just try my best to avoid getting too much water or shampoo on my face to keep them looking as airy and fluffy as possible after they dry. I've found that they tend to start falling apart and clumping together slightly if they get wet more than once, and I'll have to swap in new Gossamers if I want to keep them looking fresh. It's truly game-changing to me that I can get the natural, fluttery look of lash extensions without having to lie down with my eyes shut for over an hour, giving someone else the power to determine the final look. It's an empowering feeling, to be in charge of your lash destiny! (Lashify, feel free to use that as your new tagline.) Plus, the Gossamers are so light and easy to remove that they leave zero damage to my actual lashes. I just make sure to use a growth serum (GrandeLash and Talika are my faves) on my days off to make sure my natural lashes are in good shape. Yes, the Control Kit is pricey at $125, but you can create at least two or three full sets of lashes from everything included, which pretty amazing considering you have to shell out $100+ for just one full set of lash extensions. Plus, if you're a full-blown obsessive, you can sign up for the Lashify X program, where you pay $40 a month and get four sets of Gossamers of your choosing. So technically, you'd only have to pay for a Control Kit once, then just buy the Gossamers each time since the adhesive lasts forever and you only ever need one fusing wand. A lot of people might be wondering, But why would you pay $125 for false lashes when you can get them for $3 at a drugstore? Well, first of all, comparing Lashify to drugstore false lashes is like comparing Veuve Clicquot to Sprite. Do they both have bubbles? Yes. Are they both sort of sweet-tasting? Yes. But anyone can tell you that's where the similarities end (especially because Veuve is the one that gets you happy-drunk and thus wins automatically). Yes, you could go to the drugstore and get false strip lashes or even individual lashes, but the final effect won't look half as mind-blowingly natural as what Lashify looks like. I would say that if you like to use a strip lash on special occasions but are pretty happy with the natural state of your lashes on a daily basis, or if you want your lashes to look super-bold and clearly faux, Lashify is probably not for you. But if you are obsessed with lash extensions and want an alternative that won't damage your lashes or just want long lashes that actually look like they could be real, then Lashify just might change everything. I know it did for me. Now, excuse me while I go fuse my lashes. Head to Lashify's Instagram page to learn more.